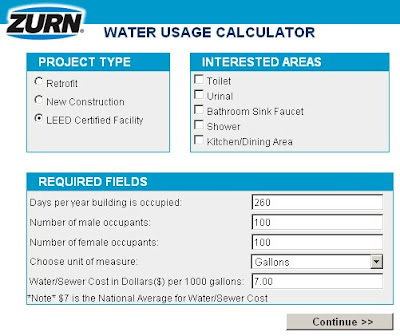 If you haven't found it already, Zurn has an online water use calculator that features a LEED option for comparisons. It allows you to quickly check the difference between various efficient fixtures for Water Efficiency Credit 3, Water Use Reduction. It isn't perfect (doesn't show total use reduction percentage), but it's extremely quick. It allows you to pick your scope (ie... if showers aren't in the project you simply don't include them), and the baseline fixtures are already loaded for you! I could explain further, but just check it out yourself! Know of a better resource available for checking water use please share by leaving a comment. Looking for as much LEED CI info as possible. This caluculator uses a baseline flow rate for lav faucets (2.2 gpm) that worked for pre-2009 rating system versions, but not longer works for LEED 2009 projects. The baseline flow rate for commercial lav faucets is now 0.5 gpm. In trying different combinations of data it appears the only variable that has any affect on the final reduction percentage is the gallons per flush. Is this correct? Is this calculation independent of the number of occupants or days per year the building is occupied?